Listen. I’m going to just put it out there. No one tells you that making friends as an adult (after you have left school or college) is not as easy as it looks on tv. No one tells you that making friends after you relocate is challenging. No one tells you that making friends when you are an adult who relocates to a new city and is staying home with kids is more than challenging. I’ll be the one to tell you - it is a friend seeking obstacle course. I am very thankful to have wonderful friendships with friends I grew up with and friends I met in college. When my husband and I moved from the Atlanta area shortly after we were married to Baton Rouge, I was very lucky to immediately become friends with my coworkers and women at church. So, I thought when we moved from Baton Rouge to the Upstate of South Carolina, it would also happen immediately. Ha. Ha. Ha. Let me tell you some of my favorite “I’m new here and desperately need friends” stories. Upon moving, I began working from home. This eliminated the possibility of friendships with coworkers. After my husband asked me at dinner on numerous occasions what my friends on The View said that day, I knew it was time to put myself out there. As a first time pregnant mom, I excitedly signed up for prenatal yoga classes. Hooray! This is where I would find my mom friends. Keep in mind that I had never done yoga a day in my life. After purchasing all my new maternity yoga gear, I headed off to the hospital where the classes would take place. And lo and behold, I was the only class member! This yoga newbie got one-on-one yoga classes. But, sadly, I did not meet my mom friends. On another occasion after my son was born, I reached out to a stranger on a local mom website and agreed to meet at her church. I very anxiously attended the church service and she was nowhere to be found. Church tricked, y’all. Another time I was super excited to see a couple that we had sat next to in a Sunday School class out at a local restaurant. But, they had no clue who the really happy energetically waving woman was. It was very reminiscent of that iconic scene in Sixteen Candles where Jake Ryan waves at her and she is not sure he means to be waving at her, except much sadder. I attended a posted Moms Night Out in the community. Only one other mom showed up – the host. She wanted to sell me something. I practically begged a mom I met at library storytime to be my friend. It was embarrassing. There was some stuttering and some awkward, “Oh our boys play so cute together (mind you, they were not even one). You’re from Georgia? Me too! We should get together for a playdate. What’s your number?” I think she gave me a fake number. She is not my friend. After I realized approaching strangers at the park was not going to work, I decided to join a moms group. Before motherhood, I did not know this was even a thing. People kept telling me to join a moms group of some sort, but it seemed so out of my comfort zone. Who goes to these types of things? Apparently, women looking for mom friends. I hesitantly joined my first MOPS(Mothers of Preschoolers) group. I met wonderful women who also desperately needed a safe place to talk and eat with other moms child-free. Over time, I did get to know the women there. I was overjoyed when I ran into a fellow mom at the grocery store. Someone knows me in this strange town! They waved and said hello! I have a friend! I took over running it for the next three years. A tremendous blessing for many reasons, but mostly because I recognized that those intense feelings of loneliness were common and I could give other moms a place to develop relationships with people other than their children. It gave me the courage to harass a fellow member to join her book club. I could have followed societal rules and waited until she or someone else asked me to be a part of a book club (something I really really wanted), but I didn’t wait. I invited myself and it made all the difference. That book club I invited myself to has become the one event I clear my calendar for every month and the place where I am the most genuine version of myself. I decided to join another moms group. This one is called Moms Club International. I have slowly gotten to know moms from this group outside of MOPS for years now. They just knew me as Jen and not as the MOPS Coordinator which made a big difference. That Moms Club has also formed a book club, which I love. It is filled with smart women who make me laugh and challenge my thinking. When my first child was born, I did not have any friends where I lived. It was hard. But, to survive the monotony, I had to do the hard work of finding people who could help me remember me. And, I did. When my second child was born, I was overwhelmed by visitors and meals and phone calls. It was a complete reversal. I ran that obstacle course and I finished it with just a few hiccups. 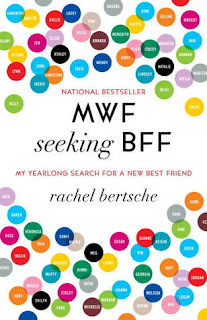 Recently, my book club read MWF SEEKING BFF: My Yearlong Search for a New Best Friend. This memoir focuses on the author’s goal of making new friends in her new town by going on 52 blind friend dates. Not surprising to me, our discussion focused on why it so stinking hard to make friends as grown-ups. Ironically, most of us really want friends. We just don’t know how. If you are relocating or simply in a new season of life, I encourage you to put yourself out there and just admit it. I bet you will find you are not the only one. Do you have any fun stories of your own friend obstacle course journeys? Share them with me! *This post does can affiliate links. Thank you for supporting my blog! As a military wife, I can relate to your experiences 100%!! Everytime we relocate, it always seems to be a challenge to make new friends! Sometimes it is easy, sometimes not. I have similiar stories, where I put myself out there and the relationship doesn't go anywhere, but I've learned to put myself out there because we only have a short season to actually be friends. Recently, I met some other moms at the park, we made small talk, and I our myself out there, basically telling them my life story (lol)m so, I thought to myself, "this is going somehwere." Hahaha...no. We all left the park, no numbers exchanged, no future meet up plans, and no facebook info! It felt like a waste of time, but I know eventually I'll make some more friends, I just have to keep putting myself out there. Bless you military wives! I cannot imagine doing it over and over again. It is so hard. You'll find your people, but hopefully it won't take you as long as it did me. On a side note, one of the things I have learned from the book and put into practice is actually specifying a time and place. Women tend to say things like, "Let's get together sometime!" And they want to, but with kids and everything else going on, they don't get to it. If you say, "Would you like to meet for coffee on Friday?" it works much better. At least that has been my experience.